Tumblr is a very visual way of blogging. One of the many beauties of Tumblr is its simplicity and easy interface. You can create an account, choose a URL, select a design theme and create your first post in under five minutes. It is free and it is social: users can reblog, flag up things they like and engage by asking questions and commenting. Since each Tumblr blog has its own URL, you don’t need to be a member to view posts. Although it has been around since 2007, over the past year it has been growing at an incredible rate. “Right now Tumblr serves up 5.7 billion pages each month; this is growing by 400 million more pages every week,” Mark Coatney from Tumblr told Journalism.co.uk. Almost half the Tumblr pages viewed are from the US, but the UK Tumblr community is growing fast and it now has 4.5 million unique users and 8 per cent of page views making it the third largest country on Tumblr. The US is first, with 32 million people visiting the site; Brazil second with 5.6 million. News organisations are joining Tumblr. The New York Times T Magazine officially joined earlier this month following the controversial axing of an unofficial Tumblr blog. Five of the best Tumblr news blogs are at this link. Tumblr, which was started in New York in 2007, by David Karp when he was just 20, almost became too popular for its own good. In December, rapid expansion led to it being down for eight hours. It has since opened another data centre to cope with capacity. There are seven post types: text, photo, quote, link, chat, video, plus you can ask or answer questions. You can post from the web-based dashboard or by downloading the free iPhone, Android or BlackBerry app. There are also other options including posting links from Bookmarklet, publishing via email and other third party applications (find out more via the Goodies tab on the dashboard). You can decide to follow people or organisations, much as you do on Twitter. You can reblog (similar to retweet) and “like” a story. Followers can also ask questions or leave messages. You can create a group blog so several members of a team can contribute (go to the dashboard and members). There are some great examples of news organisations getting to grips with Tumblr with the Guardian leading the way in the UK. There are some great examples from the worlds of fashion and art. Tumblr’s Mark Coatney pointed us in the direction of this Short Form Blog, a really nice independent site that does news analysis and curation. To engage with the 4.5 million UK Tumblr users. “Our use of Tumblr is neither a marketing exercise nor a means by which to generate simple click-throughs,” Stephen Abbott, executive producer at Guardian.co.uk told Journalism.co.uk. Get a feel for Tumblr and decide whether it is suitable for you or your news site. “I would advise any journalists thinking about using Tumblr for their organisation to first get to grips with the nature of the platform and become familiar with the practices and tone used on Tumblr. “Then they’ll be in a much better position to decide whether they could find a opening or niche on Tumblr which could be filled by their journalistic output,” Abbott explained. Think about how you can engage without the Tumblr community and what you want to blog. Perhaps you can use it for fashion and lifestyle, the best photography from your publication or as a way to connect readers with your newsroom. The Economist’s Tumblr blog includes its cartoons and front pages. News organisations can use Tumblr “as a way into specific niches” of the organisations, Tumblr’s Mark Coatney advises. The second piece of advice Coatney has is for organisations to use Tumblr “as a way to foster peer-to-peer communication between news organisation and reader”: GQ’s Tumblr, for instance, does an excellent job of using Tumblr’s “ask” feature (every Tumblr blog as an ask me a question page) to bring readers inside the GQ’s office. His third piece of guidance is to use Tumblr “as a way to bring the intelligence of the newsroom to the public: CNN Money Tech has a group Tumblr that replicates the chatter that goes on in newsrooms every day; a cast of seven CNN reporters regularly dash off short notes and observations about stories they’re following throughout the day”. Think visually. And also in terms of video and audio as Coatney explains. Tumblr is a very visual platform; of the 25 million posts done every day on Tumblr, half of them are photos. Posts with striking visuals tend to be reblogged more by other users as well, helping to spread the content quickly throughout Tumblr’s network. The Guardian’s Stephen Abbott said: “We will often strive to post stories which have striking pictures or video to accompany the text of the post. Along with receiving much attention for its use of Tumblr at SXSW, the Guardian has carried out two other experiments as part of its editorial coverage: this Glastonbury 2010 scrapbook and this one on untangling the web. Think about who will manage it. Large news organisations use community editors. “The Guardian Tumblr account is managed by our news community coordinators Laura Oliver and James Walsh,” Abbot explained. Upload a picture/avatar. This is probably going to be your logo, perhaps the same as your Twitter thumbnail. Now choose a design. You can opt for a free theme, pay for a premium one (costing between $9 and $49) or you can customise your own (perhaps with the help of a developer). Look around at other examples and see what is most effective. 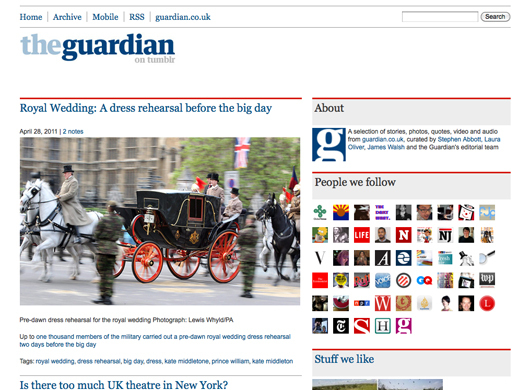 “We looked at many Tumblr accounts before creating the Guardian Tumblr in order to survey the enormous variety of designs and layouts available – but we didn’t copy any of these. “Our designers came up with a look and feel for the Tumblr which was distinct to the Guardian but which capitalises on the strengths of Tumblr,” Abbott said. Download the free smartphone app if you want to post from away from your desk/laptop. Connect with Facebook and/or Twitter if you want your posts to be automatically added to your Facebook and Twitter news feeds (via customise on the dashboard). Bear in mind it will indicate that the post is via Tumblr. Consider other add ons. Tumblr supports short comments but you can also add your Disqus account you can also take advantage of Tumblr’s own back up tool. You can decide whether or not you want to embed the blog into your own website (via Goodies). Get ready to analyse. Paste your Google Analytics code into your site description in the customize menu. You’ll also be checking the notes section to see what has been reblogged. You don’t necessarily have to heavily promote your Tumblr blog. “We have alerted Guardian readers to the presence of the Guardian Tumblr via our main @Guardian Twitter account but, at present, we don’t promote the Guardian on Tumblr across our other platforms.” Abbott told us. How did you get on? Let us know when your news organisation has set up a Tumblr account. This entry was posted in Design and graphics, Handy tools and technology, Multimedia, Niche, Online Journalism, Photography, Social media and blogging and tagged Al Jazeera, Economist, how to, iphone app, LA Times, mark coatney, short form blog, stephen abbott, The Guardian, The Washington Post, Tumblr on April 28, 2011 by Sarah Marshall. Pingback: Sarah Devaki is a teenage blog about pop culture, funny events, and anything entertainment for the fans of Sarah Devaki.